This documentation refers to versions 0.4.11 or older. Documentation for 0.9.0 or newer is here. Rapid Photo Downloader is a photo and video importer from cameras, memory cards and Portable Storage Devices. It can download photos and videos from multiple devices simultaneously. It provides many flexible, user-defined options for subfolder creation, photo and video renaming, and backup. This documentation contains a description of Rapid Photo Downloader's features and how to make the most of them. 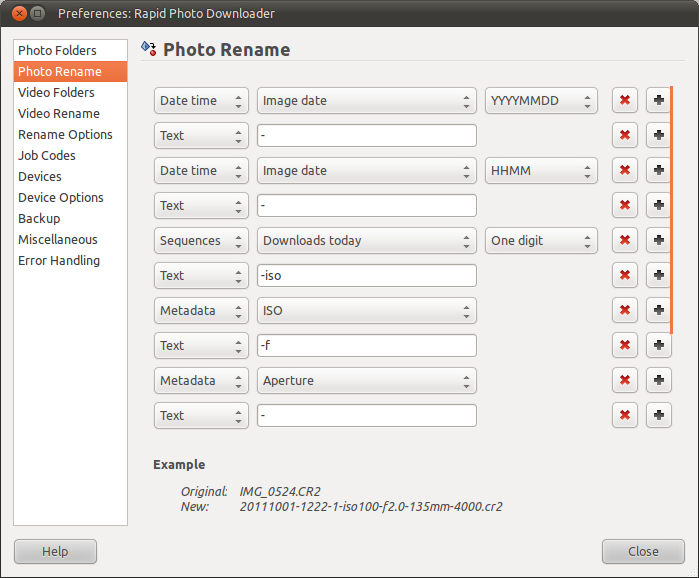 When you are comfortable your choices meet your requirements, you can automate aspects of Rapid Photo Downloader's operations. 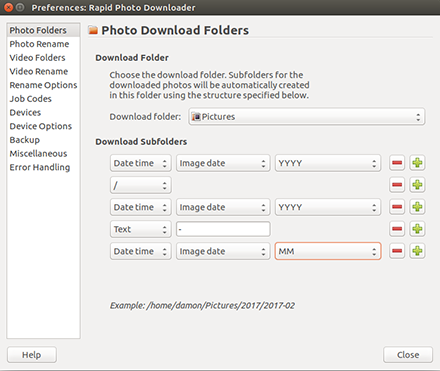 Read how to install Rapid Photo Downloader. Rapid Photo Downloader scans available photos and videos, and gives you the option of choosing which files you want to download. You can download all the photos and videos, or only files you've specified. If you choose to download only selected files, for each device the progress bar will show how many files remain to be downloaded. The toolbar at the top of the main program window allows you to configure where files will be downloaded from, whether they will be copied or moved, and where they will be downloaded to. If the move option is chosen, upon the completion of a download, photos and videos that were successfully downloaded will be deleted from the device they were downloaded from. Photos and videos that were not downloaded successfully will not be deleted. If backups are enabled, and the file was not backed up, it will not be deleted. You can simultaneously mark multiple files to download or not download—there is no need to manually place or remove a checkmark for each file. To do this, select which files you want to mark, and then check or uncheck one of the files you have selected. This will affect all of the selected files. You have the option of assigning Job Codes to your files before your download them. A Job Code is text that you assign to photos and videos. They are helpful if you want to describe the set of photos and videos in each download. 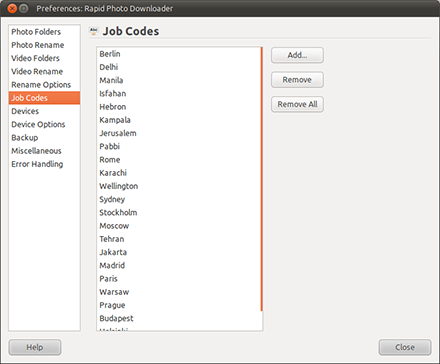 A job code can be used as part of a subfolder name or the photo and video file name. To assign a previous Job Code to selected files, select it from the drop-down list, or simply start typing and previous matching entries will be displayed for you to select. To assign a new Job Code to selected files, type a new one in the entry box and hit the Enter key. The Job Codes are displayed in the order they were last used. Tip: If you want to assign a different Job Code to each photo or video, you must download your files in batches. You will be prompted for a Job Code in a pop up window when a download begins. If you simultaneously download from more than one device, the job code will only be prompted for once. In other words, if you are already downloading from one device, and you insert a second device, it will use the job code you have already entered. 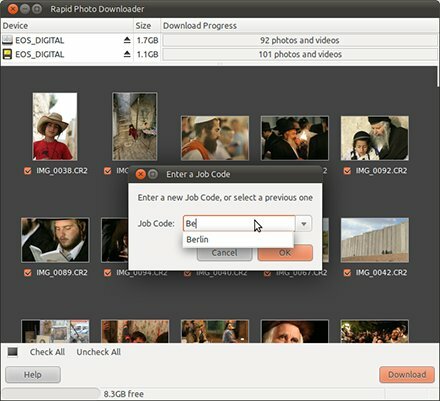 Whenever a download has finished, if you insert a new device and don't assign Job Codes before commencing a download, Rapid Photo Downloader will prompt again for a Job Code. You can select the Job Code you just used, or specify a new one. If you download from more than one device simultaneously, a download is finished whenever all the devices have been downloaded from. When both automatic detection and Portable Storage Devices are enabled, Rapid Photo Downloader will prompt you whether you want to download from a new device. This is convenient when you never want to download from a device or partition on your computer. 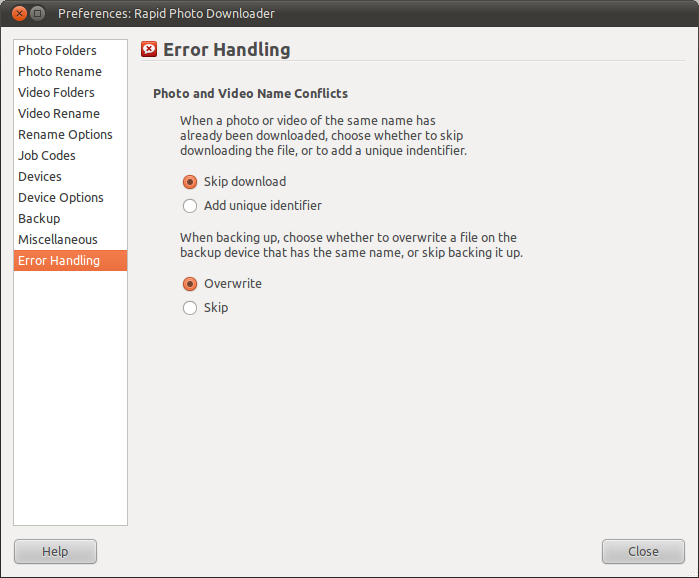 If you want Rapid Photo Downloader to not prompt you every time it runs, check the checkbox Remember this choice. You can undo this choice by removing it from the Remembered Paths in the Device Options section of the program Preferences. Rapid Photo Downloader downloads your files into primary download folders—one for photos, and one for videos (they can be the same folder if you wish). It then automatically creates subfolders, as needed, based on the options you specify. Tip: See the section Specifying Custom File and Subfolder Names to learn how to generate your own custom download subfolder names. You can choose from among a variety of options for the creation of subfolders. They are the same for photos and videos, except for differences in metadata options. See Date and Time options for Photo and Video Renaming for a description of the available options. You can enter free text here, such as the photographer's name. Sometimes it is helpful to classify photos and videos into subfolders based on the file's extension, particularly when the camera is set to generate both a RAW phot and a JPEG photo from the same exposure. It makes no sense to generate subfolder names based on any other part of the filename, so Extension is the only choice available. Tip: The period (dot) will not be included as part of the subfolder name. 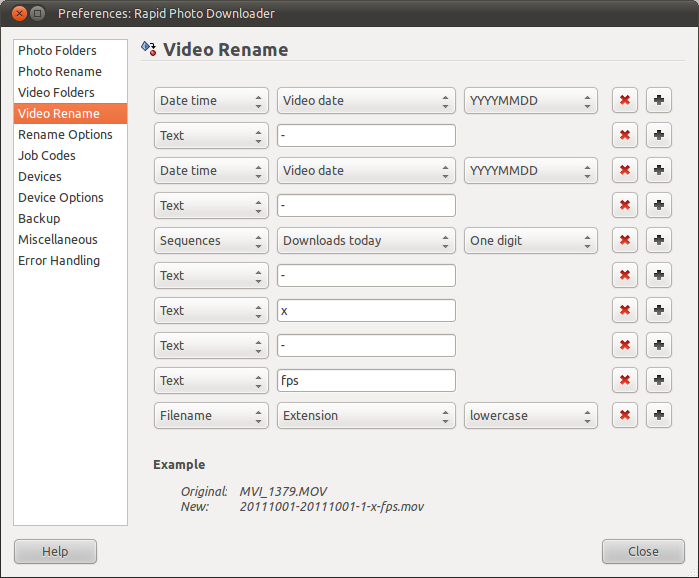 See Photo Renaming Metadata and Video Renaming Metadata for a description of the available options. Job codes are especially helpful in describing the contents of a folder. See the section on Job Codes below for what they are and how you can use them. This is what allows you to create subfolders within other subfolders. Tip: There is no need to start or end the subfolder options with a separator. If you do, it will automatically be removed. 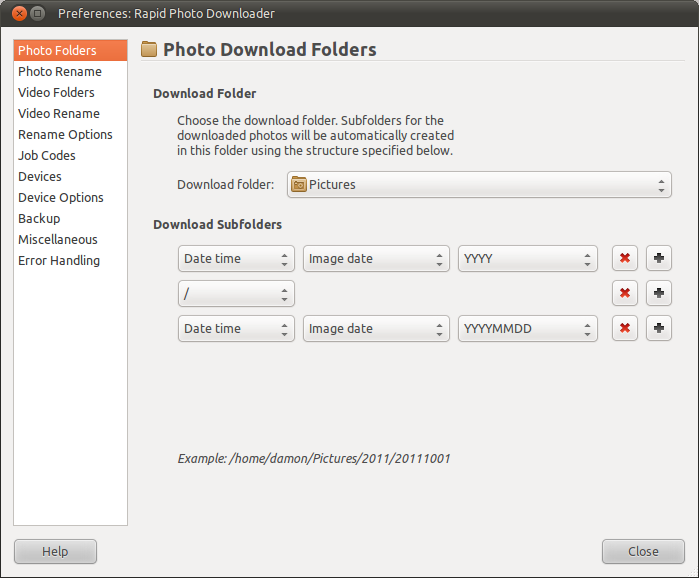 One of Rapid Photo Downloader's most powerful features is its ability to generate meaningful file names using criteria you specify. The following options can be combined to generate limitless variations. Tip: Do not forget the file extension. Tip: Putting some thought into choosing a worthwhile system for generating filenames can make your life easier in future, particularly if you store tens of thousands of photos or more. 3Download time:the time at which the download was started. If there is more than one device being downloaded from at one time, the time for the first device will be used. The options available for both are the same, except for the additional choice of subseconds with the photo date and time. Tip: AVI files do not contain any date and time metadata. Instead, the file modification time is used as a substitute. Tip: If subseconds metadata is not available in a photo being downloaded, it will be set to 00 for that photo. Here you can enter free text to include in the generated filename, such as a hyphen or a name of some kind. 3Extension: The filename's extension only. The period (dot) is already included. You do not need to add one yourself. 4Image number: The component of the filename which is made up of a series of numbers. These are the numbers which are automatically incremented by the camera (typically 4 digits in length). For example, the image number of the filename IMG_0524.CR2 is 0524. For a filename like VD1D7574.CR2, it is 7574. You can specify how many digits should be used: all of them, or the last one, two three or four digits. Video metadata options can be used in video renaming and video subfolder creation. Tip: Sequence values are shared among both video and photo downloads. If you use sequence values only in photo filenames, for instance, downloads of videos will still increment the sequence values being used. The number of digits used to generate the sequence number can be specified to be one of one, two, three, four, five or six digits in length. Specifying an option longer than One digit is helpful when you want to keep overall filename length consistent, because sequence number values less than the length specified by you will be padded with zeros preceding the actual value, e.g. 0001. Tip: If the length of the sequence number is longer than the length you specify, then the actual length of the sequence number will be used. For example, if you specify One digit, and the sequence number is 1067, then 1067 will be included in the filename. Sequence numbers are never truncated. Stored and session numbers are incremented only when you use them. For instance, if you download some photos without using these sequence numbers, and then download some more photos using them, the prior download will have no effect on the value of the sequence numbers. This sequence number tracks the number of successful downloads made on any one day. During each new day, the sequence number is reset to zero. In contrast to other sequence numbers, this sequence number is updated regardless of whether it is used or not. That is, whether or not you use the Downloads Today sequence number as part of the photo or video file name, the number will always reflect how many successful downloads were completed on that day. See Rename Options to learn more about the Day start option. Sequence letters are generated using the pattern a, b, ...z, aa, ab, ...zz, aaa, aab, and so forth. Like stored and session numbers, they are incremented only when you use them. Job codes are helpful in describing the attributes of a set of photos and videos, for example photos from a wedding. See the section on Job Codes for what they are and how you can use them. If you want to generate file and subfolder names that are not found in the pre-defined options that come built-in to Rapid Photo Downloader, you can combine the built-in options to create your own. In the above illusration, the Date and Time metadata component YYYY is followed by a Text component, which contains a single short hyphen character, followed by the the Date and Time metadata component MM. You can of course combine components like this in practically any manner you like. These options relate to photo, video and subfolder names. Here you can set the values for Downloads today and the Stored number, if you need to adjust them for some reason. You can also specify the time a day "starts". This is useful if you use the Downloads today sequence number and often photograph something late at night (e.g. concerts) and you want to start a download after midnight. Here you might like to specify that a new day to "start" at 3am, for instance. This option is useful if you use the RAW + JPEG feature on your camera and you use sequence numbers or letters in your photo renaming. 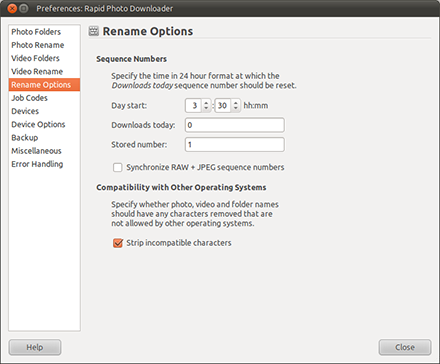 Enabling this option will cause the program to detect matching pairs of RAW and JPEG photos, and when they are detected, the same sequence numbers and letters will be applied to both photo names. Furthermore, sequences will be updated as if the photos were one. For example, if 200 RAW photos and 200 matching JPEG photos are downloaded, the value of Downloads today will be incremented by 200, and not 400. The same goes for the rest of the sequence values, including the Stored number sequence number. Matching photos are detected by comparing filename, as well as the exif value for the date and time the photo was created (including subseconds when the camera records this value). This option will take effect regardless of whether the RAW and JPEG photos are stored on different memory cards or the same memory card. Furthermore, if they are stored on separate memory cards, you can download from them simultaneously or one after the other. The only requirement is to download the photos in the same session—in other words, for the feature to work, use as many memory cards as you need, but do not exit the program between downloads of the matching sets of photos. If checked, then characters that are invalid in filenames in operating systems other than Linux are stripped from the generated filename. These characters are: :, *, ?, ", <, >, and |. Furthermore, any white space (e.g. spaces) beginning or ending a folder name will be removed. Tip: If you ever want to share your photos with people who use Microsoft Windows,™ then keeping this checked is a good idea. If you want to delete any previously used job codes, or enter new ones, you can do so through the program preferences. Tip: Remember, it's often far more efficient to assign a Job Code in the program's main window. Devices are devices from which to download photos and videos, such as cameras, memory cards and Portable Storage Devices. Please note that support for downloading directly from a camera is experimental, and requires a recent version of the Gnome libraries. It works better with some cameras than others. The camera must also be supported by libgphoto2 in combination with gvfs—if you cannot browse the camera's contents in a file manager (e.g. Nautilus), the camera download will not work until gvfs support is improved. Tip: If downloading directly from your camera works poorly or not at all, try setting the camera to PTP mode. If that is not possible, consider using a card reader. Modern card readers, including inexpensive models, provide much faster download speeds than almost all cameras. Tip: You can download photos from multiple devices simultaneously. If you regularly download photos from more than one memory card, you may like to consider downloading your photos in parallel using more than one memory card reader. See Tips for Downloading from Multiple Memory Cards. 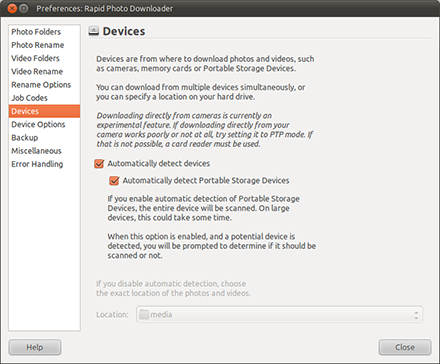 When automatic detection is enabled, Rapid Photo Downloader scans a device's folder structure and contents to determine if it contains photos. It does this by checking if the folder DCIM exists in the device's root directory. This folder is always created by digital cameras. 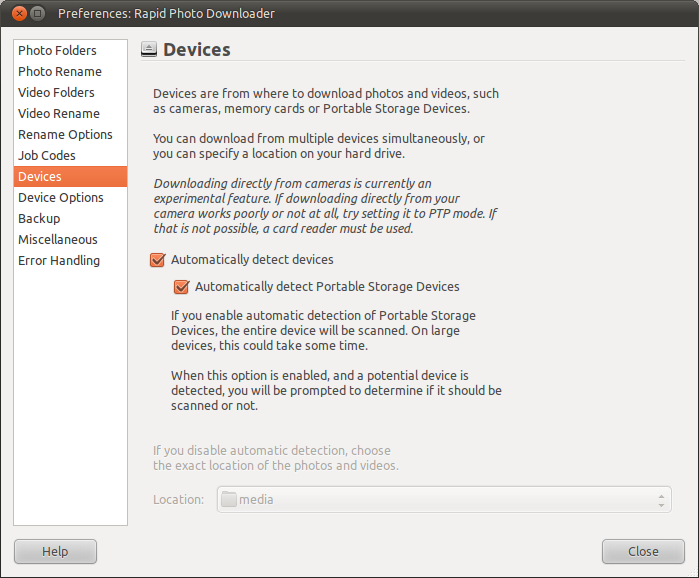 If this folder does not exist, then unless you have specified automatic detection of Portable Storage Devices, the device will not be scanned for photos. 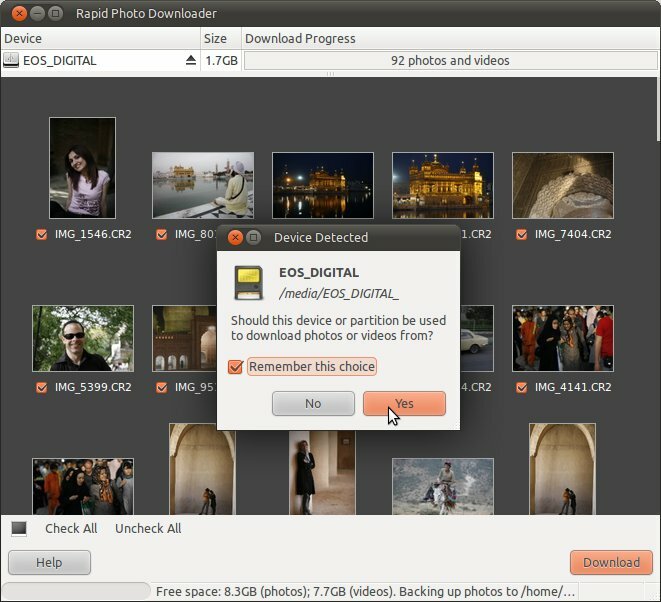 A Portable Storage Device is a small device used by photographers who need to download photos from their memory cards without using a computer. It typically consists of a hard drive, a built in card reader, and a screen. They are particularly useful when the photographer expects to be in the field for days at a time, or at any time when they take more photographs than their memory cards can hold. There are a variety of models from numerous manufacturers large and small. Unlike with digital cameras, no standard exists specifying their folder layout, so each manufacturer does something a little different. Because of the lack of a standard, if you enable automatic detection of Portable Storage Devices, the entire device will be scanned for photos. 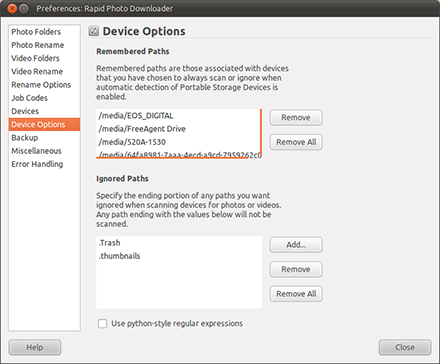 Rapid Photo Downloader will prompt whether you want to ignore or download from a device if you have selected the options for the Automatic Detection of Devices and the use of Portable Storage Devices (this is discussed in the section Prompt to Download from New Devices). If you want to undo a choice you previously made about devices to always ignore or download from, you can remove its path from the list of Remembered Paths. Ignored Paths are useful when you are downloading from a device or location that contains one or more subfolders from which you do not want to download. 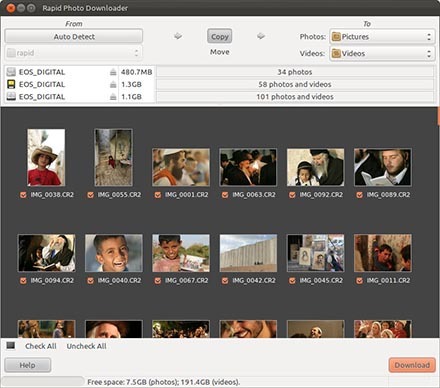 For example, some cell phones include a subfolder that contains thumbnails of the photos and videos you've taken, such as a .thumbnails subfolder in the DCIM folder. Here you can specify which subfolders you do not want scanned for files. You do this by specifying only part of the subfolder's path, which is typically just the name of the subfolder itself. The folder structure and filenames used for the backups will be identical to those used for downloading onto your computer's primary drive. Although backing up photos as soon as you download them slows down the download process, it can give you peace of mind as you work with the photos on your computer. You can manipulate and delete them all the while knowing that if you make a mistake or change your mind, you can safely retreive them from your backup. Tip: If you work with many photos—particularly RAW files—and videos you may find that your computer's capacity to store all of these files is easily overwhelmed. In such cases, your workflow will probably involve some kind of system where you have two copies of each file being stored on external drives or some other kind of backup medium. Backing up to two devices simultaneously is very helpful for workflows like this. Tip: You can use the same folder name for both photos and videos if you want them backed up to the same folder. Backup devices are automatically detected by scanning devices to see if they contain either of the names specified in Photo backup folder name and Video backup folder name. The Preferences dialog window provides three examples of the path it will search for to determine if a device is used for backup or not. 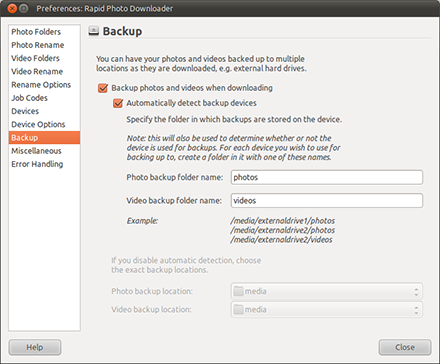 Tip: Whenever a device is plugged in, if backups are enabled, Rapid Photo Downloader will check to see if it can be used for backups before it will check to see if it is a device from which photos can be downloaded. 1Start downloading at program startup will download from whatever devices are plugged in as soon as Rapid Photo Downloader is started. 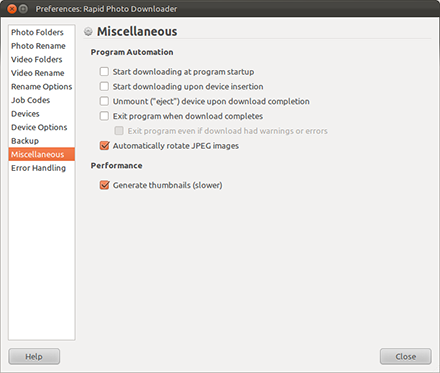 2When Rapid Photo Downloader is already running, Start downloading upon device insertion will start downloading from devices as soon as they are plugged in. This is especially useful when you are downloading from more than one device at a time. 3Unmount ("eject") device upon download completion allows you to remove a device from your computer as soon as photos and videos have finished being copied from it. 4Exit program when download completes causes the program to exit once all downloads are complete, as long as no errors or warnings of any kind were issued. 5Exit program even if download had warnings or errors will cause the program to exit after download completes irrespective of any warnings or errors. 6Automatically rotate JPEG images: losslessly rotates JPEG images using the program exiftran. Exiftran rotates images automatically by checking the exif orientation tag, updates the exif informaton if needed (image dimension, orientation), and rotates the exif thumbnail. You can slightly increase download speeds if you turn off the generation of thumbnails. The difference is usually fairly trivial, however. Unique identifiers are generated by adding a suffix _n (where n is a number) immediately before the image's filename extension. If it does not have an extension, the identifier will be placed at the end of the filename. The number is the lowest number that can be used without overwriting an existing file. If a duplicate filename occurs in the backup location, Rapid Photo Downloader can be configured to overwrite it, or skip backing it up. Tip: Scenarios like this are an example why turning off error messages when duplicate filenames are detected can cause you to overlook unanticipated problems. The American Society of Media Photographers' Digital Photography Best Practices and Workflow website contains guidelines on coming up with an excellent file renaming system. The project was funded by the United States Library of Congress through its National Digital Information Infrastructure and Preservation Program. These folks know their stuff! When configured like this, as soon as you attach a memory card, its photos will be downloaded. When the download from that memory card is complete, another one can be inserted. It will automatically start to download from that one, even if it is currently downloading from other cards. If you like this software, please consider making a contribution. Thank you! Copyright © Damon Lynch 2009. Template by CSS Templates Market.